A dealer often will show you monthly payments and leave out interest rate information. 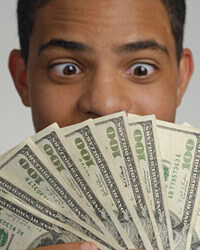 Longer loans have much lower monthly payments, so you may think they are the best option. If you ask about the interest rate, the dealer may show you straight interest rate, not annual percentage rate. This means you are only seeing a small picture of the complete cost of the financing. The difference in interest rate between a short loan and a long loan is likely less than half a percent. The difference in APR, though, can be a few percentage points. Opting for a short loan will save you money. Part of your financing is your down payment. Most buyers trade a car in to supply the down payment on a new loan. The higher the trade-in, the lower the limits you will need on your new loan. The dealer has no incentive to quote you a fair price on the old car. Instead of taking the dealer's word for its value, you should seek alternative quotes. Try going to a used car dealer and asking for a fair evaluation. You can also check the Kelly Blue Book and National Auto Dealers Association prices. Dealership lenders love to use cosigners on loans. If you provide a very high credit cosigner, the lender is pretty much guaranteed the loan will not go into default. Both you and the cosigner are taking all the risk, while the lender is left with virtually no risk at all. If you were to go to a bank for the loan, you would find a different story. Taking a loan without a cosigner reduces your risk and adds potential credit benefits to the loan. Do not use a cosigner unless you have exhausted options for loans and know it is the only way you will get financing. Auto dealer loans typically have the highest prepayment fees in the business. Since they are offering low interest rates, they use terms like prepayment fees to protect their earnings. Essentially, the dealer structures you loan so you are paying off interest first. You do not pay down your principal until you are well advanced in the loan and interest has already been paid. This means, when you say you are ready to pay off the loan, you will be quoted a much larger sum because very little of your principal has been reduced. Bank loans are more likely to apply interest evenly over the course of a loan. What is a Broker Dealer?4 Tips to Get Auto Financing with Little or No Credit HistoryAuto Financing through a Credit Union: 3 BenefitsWhat Can Asset Turnover Tell You about a Company?